Last week I was out scouring the shops in Gisborne for the new Whittakers artisan chocolate range. I tried the supermarkets (big and small) and after searching high and low and not finding any, I decided perhaps The Warehouse might have some. Desperate measures call for desperate moves and anyhow, I needed to go back there to swap The Anster’s slippers for a bigger size. So searching high and low and The Warehouse isn’t a good idea as I approached the checkout counters with a bunch of stuff I didn’t need but no chocolate. I did find some Toffee Apple flavoured M&M’s and thought they might be nice. 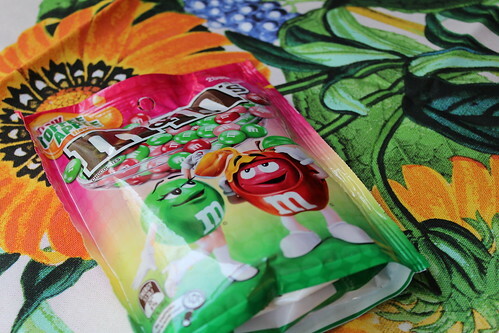 Once I was at home, I discovered they didn’t have a scrap of apple in them (well, really what did I expect from an M&M. They also didn’t really taste like Toffee Apples – though I only tried a red one. Perhaps the pink or green ones taste different?? I got out my apron and got baking. 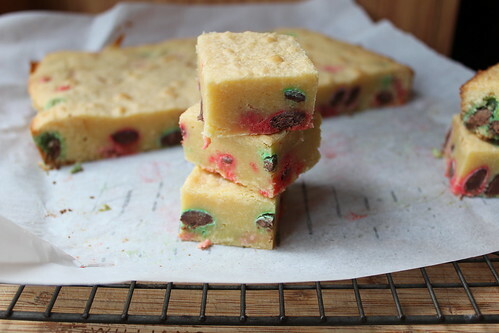 One toffee not-very-apple M&M brownie coming up. This recipe is adapted from a Jaffa Slice by Laurel Watson published in an old cooking magazine that went through several name changes then ceased to be. The jaffa slice (we call it jaffa brownie) is very popular whenever I need to take a plate to share. I have swapped the dark chocolate for white chocolate (be sure to use white chocolate that actually has cocoa butter in it otherwise it isn’t chocolate), reduced some of the butter and replaced it with apple purée (unsweetened). The toffee apple M&M’s take the place of the jaffas – and hey presto, we have a toffee not-very-apple M&M brownie that, despite not being very applely, is very nice. 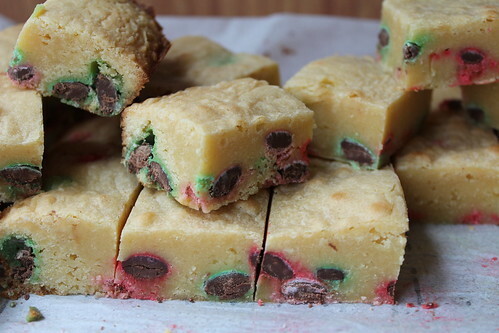 So technically it is a blondie, not a brownie. 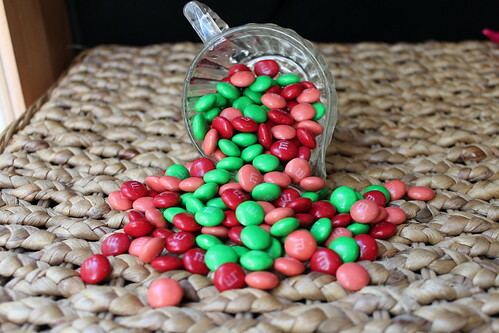 If you can’t get M&M’s, try Skittles (the sours are really good with the white chocolate). 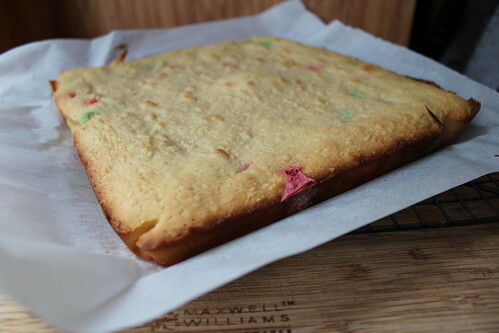 Grease and line 23cm/9″ square cake tin. Combine white chocolate and butter in a bowl and set in a warm spot (I set it on the oven while it is cooking something else, the residual heat is enough to melt the chocolate). Stir chocolate & butter to combine, then whisk in the sugar and eggs, then the flour & apple. Fold dried apple chunks into the mixture. 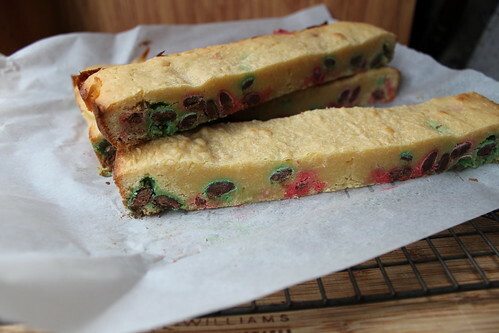 Spread mixture evenly into prepared tin. Let slice cool before cutting into squares (about 36 squares). Note: Jaffa’s are a round hard coated orange-flavoured candy ball with a chocolate centre. They are really good and a Kiwi treasure. This entry was posted in Baking, Slices & Squares and tagged Brownies, Jaffa Brownie, Toffee Apple Brownie, Toffee Apple M&M's by Jo Dohrman. Bookmark the permalink.